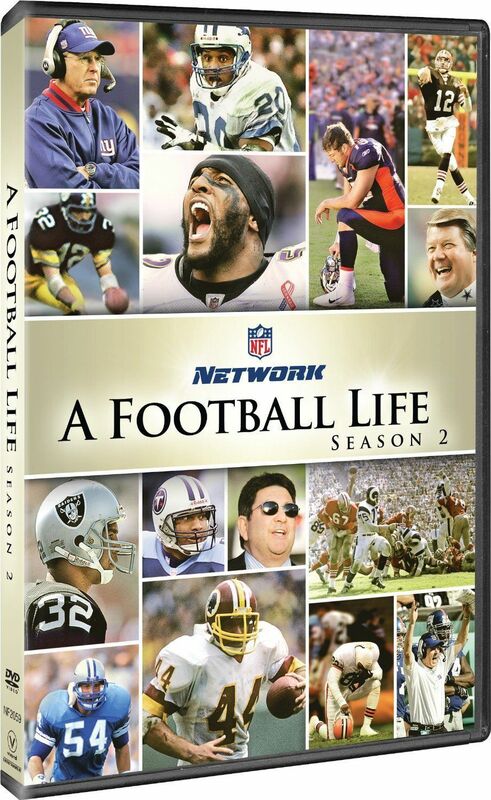 NFL a Football Life Complete Second Season 2 Two DVD Set Collection TV American Genuine U.S. Retail Release, Brand New, Original Factory Sealed Product Details Actors: Directors: NFL Films Format: Multiple Formats, Box set, Color, NTSC, Subtitled, Widescreen Language: English Subtitles: English Region: Region 1 (U.S. and Canada only.) Aspect Ratio: 1.85:1 Number of discs: 5 Rated: NR Not Rated Studio: NFL Productions DVD Release Date: September 3, 2013 Run Time: 300 minutes The untold stories with unprecedented access into the some of the most influential NFL icons. Each film tells the story of how their legacy is forever intertwined in the fabric of NFL history. An inside look at some of the NFL's most iconic moments, personalities and players. Program Features: Faces of Tim Tebow Ray Lewis Tom Coughlin 1995 Cleveland Browns The Fearsome Foursome Steve McNair Eddie DeBartolo Chris Spielman Jimmy Johnson Barry Sanders Marcus Allen The Immaculate Reception Our items are shipped from multiple locations in the US; we tend to ship from the states that are closest to your location if those states have the ordered items. Sometimes DVD sets will arrive in multiple shipments usually right around the same time. In case one package shows up first, you'll get the next package right around the same time. All of our items are 100% GUARANTEED AUTHENTIC US RETAIL DVDS OR BLU-RAYS; we do not sell copies or bootlegs! They are all purchased directly from U.S. authorized suppliers, distributors and warehouses. PayPal only. It is your best protection as a buyer. Payment Method Shipping Handling Terms Regardless of when you purchased your disc(s) from us, if you discover that one of your discs does not play or suffers from some other manufacturing defect, please contact us; we'll solve the problem immediately. Free standard shipping to the Continental USA Only. No PO/APO Boxes. Trust also in our fast customer service, providing immediate assistance if necessary. International Shipping: We will work with's Global Shipping Program on eligible items. will charge fees and manage the shipment once they receive the package. PayPal only. It is your best protection as a buyer.